Monastery No. 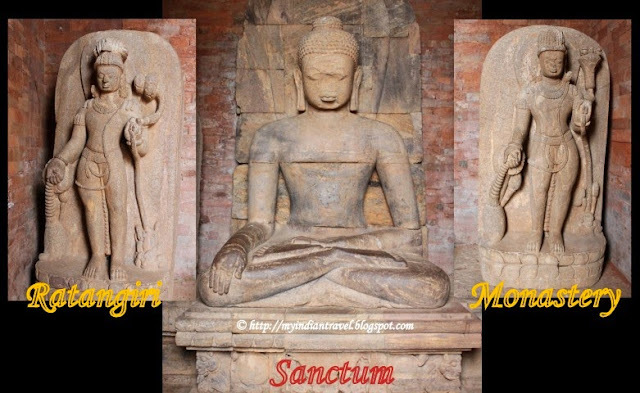 1 at Ratangiri is the biggest monastery excavated in Orissa. The construction of monastery is assignable to 8th-9th century A.D. This south facing monastery is quadrangular in shape and externally measures 55 sq. m. It has 24 cells with a spacious stone paved central courtyard of 21 sq. m. This magnificent structure is mostly made of brick but externally veneered with khandolite. The stand out feature in the monastery is exquisitely carved chlorite door-frame. In the lintel it has Gaja-Lakshmi, where as the frame has bands of floral, creeper and human shape motifs. The door frame displays superb craftsmanship in its graceful charm. The ornate doorway is unique of its kind and showcases decorative art of India. The sanctum enshrined with a massive seated Buddha flanked by the standing figures of Padmapani and Vajrapani holding fans on each side. The facade of the sanctum is embellished with creeper pattern and elegant figures of door keepers. The various sculptures carved in the monastery are true masterpieces. Magnificent monastery, nice sculptures, interesting images and text. What a neat visit to the Monastery ruins. The door frame and sculptures are amazing.. Wonderful detail. Great post, Rajesh! Have a happy day and week ahead! Nice captures of the wonderful sculptures. Love the photo of the door frame. Another beautiful place and great shots! Your two boys will know the history of India, they are lucky you take them on your photographic excursions. Is that your beautiful wife too? It's really incredible to see that the doorway is still standing. 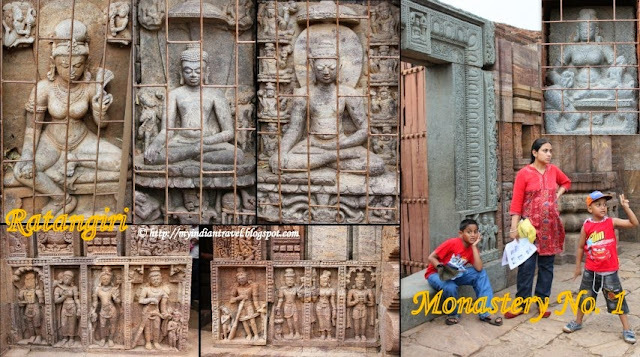 I really enjoyed this Rajesh...so many incredibly carved figures and that door is really amazing. Quite a unique stone...and that Buddha looks quite old and special. Great place - that door is exquisite. How lovely - I really like the framing in the second shot. Everything about this monastery is beautiful. I can't get over how well-preserved everything is for being nearly 2,000 years old. Yes, wonderful art in this monastery, pretty pictures! The chlorite door is superb. What a beautiful monastery ! That door frame stands out beautifully. Such beautiful architecture. I wonder how long it took the people of that time to build this place. Nice pictures. Beautiful shots. Such rich heritage we have. If only more Indians begin to appreciate it and protect it. have visited the place...it's amazing! Ratnagiri is a great place to visit. I believe it takes you one whole day to do justice to viewing all the monasteries and aterfacts over here.